I hope that everyone had a great Easter! We had a nice relaxing day at home. I woke-up early and made homemade yeast rolls. The recipe is from my mother-in-law and they always turn out delicious. For the main food I made glazed ham, buttermilk mashed potatoes and roasted asparagus with goat cheese and crumbled bacon. If you have never tried roasted asparagus before you really should. My two sons love it and ate over a pound of asparagus between the two of them. Roasted veggies are a great way to get kids to eat their vegetables since they take on a caramelized flavor. For dessert I made a gluten free yellow cake with cherry filling and homemade butter cream frosting. My boys had fun helping me decorate the cake with peeps and Cadbury eggs. It was a great day! 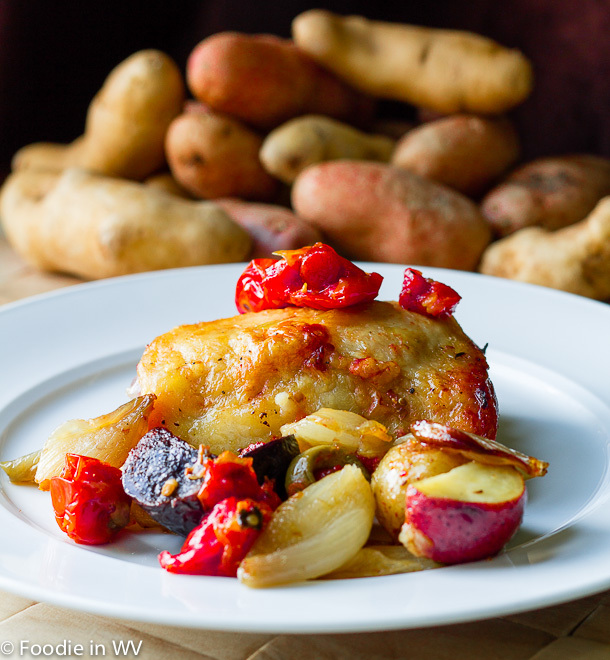 Today's recipe is for a family favorite, roasted chicken thighs. Last week I tried a new recipe for Roasted Chicken Thighs with Tomatoes, Olives, and Feta from the April 2013 issue of Martha Stewart Living. This recipe has 10 ingredients. It takes 1 hour of total time, 10 minutes of which is active and makes 4 servings. I did make a few changes to the recipe. First I had potatoes that needed to be used so I added baby potatoes cut in fourths and tossed with olive oil. My two boys love olives so I doubles the amount and sliced them before roasting. I left off the fresh mint leaves for garnish since I was serving it to my children. Make sure to temp the chicken, over cooking chicken thighs makes the meat tough. As I have said before a great meat thermometer is a must (and a great present for a home cook). The skin on this chicken turned out crispy and the thighs had great flavor. Oftentimes with roasted chicken recipes that actual chicken part of the dish turns out rather bland, this recipe was an exception. The thighs were well flavored and the vegetables turned out delicious. My two boys loved the olives and told me that this one of their favorite dishes that I have made recently. High praise from two very picky little boys. For the recipe go to Roasted Chicken Thighs with Tomatoes, Olives and Feta. Thanks :) I love roasted chicken too! That looks so mouth-watering. I love just about anything with feta, so I know this recipe would be a keeper! I love anything with feta also, it's great! I don't see a chicken recipe for thighs all that often, and that's my husband's favorite part of the chicken, so I'm glad to find this. Thanks for sharing it. Thighs are my husband's favorite also. I normally convert Chicken breast recipes to work with thighs. Ohhh, now I have to redo my shopping list so I can make this. Hope you have a great day! You too! If you end up trying the recipe tell me how it turns out! Oh my, I'm glad they crisp up like you said. I love that! I love crispy skin also, yum! Roasted chicken sounds good to me. I have started cooking again to eat a bit more healthy. Looks really good! Wow this looks good! I'm going to try it some time! Thanks :) If you end up trying the recipe tell me how it turns out!